Photo: Cedar Lawn, ca. 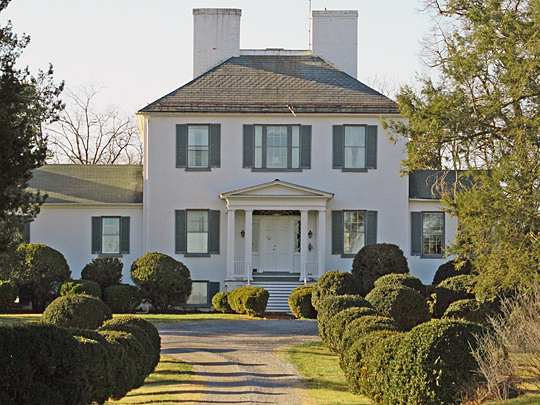 1825, Charles Town West Virginia, built for John Thornton Augustine Washington, grand-nephew of George Washington. Listed on the National Register of Historic Places in 1974. Photographed by User:Acroterion (own work), 2008, [cc-by-3.0 (http://creativecommons.org/licenses/by/3.0)], via Wikimedia Commons, accessed October, 2012. When Virginia seceded from the Union in 1861, many western counties remained Union loyalists. Together they reorganized and agreed to separation which was approved by Congress in 1863 making it the 35th state. For "West Virginia" — Messers. John Hall, President — Brumfield, Caldwell, Carskadon, Cassady, Dille, Dolly, Hansley, Haymond, Hubbs, Hervey, Hagar, Irvine, Lauck, Mahon, O'Brien, Parsons, Parker, Sinsel, Simmons, B.F. Stewart, C.J. Stewart, Sheets, Soper, Yaylor, Trainer, Willey, Walker, Warder, Wilson — 30. For "Kanawha" — Messers. Brown, of Kanawha, Battelle, Chapman, Harrison, Lamb, Montague, Paxton, Ruffner, Van Winkle — 9. For "Western Virginia" — Messrs. Brook and Powell — 2. For "Allegheny" — Messrs. Pomeroy and Stevenson, of Wood — 2. For "Augusta" — Mr. Brown of Preston — 1. So the blank was filled by inserting "West Virginia." Thus was the name changed and it seems that while the members were determined to sever their political connection with the "Old Dominion," they were not willing to abandon the name of "Virginia." Lewis, Virgil A., History of West Virginia in Two Parts, 1889, Hubbard Brothers Publishers, Philadelphia.